Hundreds of stream miles improved, trail systems developed and wildlife habitat restored. Nine nature preserves. Urban creeks. And every stretch of the Lehigh River. We are on the ground – every day – monitoring, improving and restoring acres and stream miles within and beyond our protected lands. Acting now with a focus on perpetuity, while leading the environmental consciousness of our 10-county region, enables us to knit people and places closer together to accomplish the most critical aspect of environmental stewardship – creating lasting connections to nature. With the help of volunteers and partnerships with like-minded organizations and municipalities, Wildlands Conservancy employs science-based standards and time-honored land preservation techniques to accomplish water quality and ecological restoration throughout the region we serve. 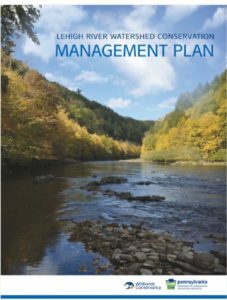 Click to view the 2018 Lehigh River Watershed Conservation Management Plan.